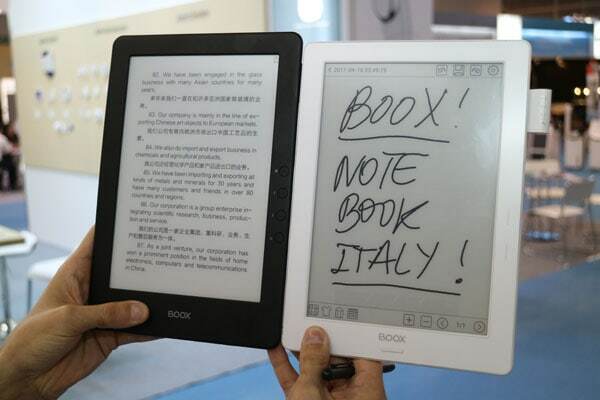 In addition to the Boox Typewriter and the Onyx Boox Max Carta Elite Ultimate, Chinese ereader maker Onyx also showed off its new 10.3" ereader at the Hong Kong electronics fair last week. The Onyx Boox e-Note is in some ways an update to Onyx's 9.7" ereaders, only with the new and not-yet-released 10.3" Carta E-ink screen. It's going to have both a capacitive touchscreen and an "active pen". It's not clear what that means, although the specs do make clear that the other touchscreen option is an electromagnetic stylus (it's an either/or situation). This A5-sized screen has a screen resolution of 1404 x 1872, or 227 ppi. That is considerably sharper than existing 9.7" Eink screens, which max out at a resolution of 1200 x 825, or 150 ppi. And yet the Boox e-Note is almost the same size as the N96 (on the left). The Onyx Boox e-Note runs Android 4.0 on a 1GHz CPU with 1GB RAM. It has 16GB internal storage, a microSD card slot, microphone, and a headphone jack. It has both wifi and Bluetooth, and the specs also mention "support" for a speaker (I did not see a speaker grill in the video, however). Weighing in at 480 grams, this device has a 4.1 Ah battery and measures 6.7 mm thin. In related news, Onyx is also updating their 9.7" ereader. The new model will have a Carta E-ink screen and is going to be called the N96 Carta. It's not clear whether the 9.7" screen will be getting a boost in screen resolution, though, and without that I really don't see why anyone would want this model. BTW, I didn't catch a mention of a release date or price. Did you? >It’s not clear whether the 9.7″ screen will be getting a boost in screen resolution, though, and without that I really don’t see why anyone would want this model. The 9.7 seems to have a new flush bezel. Kinda nice, though I see your point. Very important: It has a flexible substrate!!!! More than that, it weighs less than 380 gr. I guess because the plastic substrate. If a device has an audio chip and Bluetooth, then it has support for a Bluetooth speaker. Interesting, he said a “[USB] Type C port” but the spec sheet at about 1:00 says “Micro USB 2.0”. How can a 4100 mAh battery only give 20 days of power? That’s terrible. For comparison most Kobos (not the Aura ONE) have a 1500 mAh battery which lasts “a month”. Got any links to the FCC tests? Onyx is not just eReader, it runs on Android with multiple apps and background jobs. There are other eink devices running Android 4 that have much better battery life with a 1500mAh battery. e.g. Tolino Vision 3HD. The Onyx representative also mentions a weight of only 250 g and non-flexible for the new generation 9.7″ device at the end of Charbax’s video about the Max Carta. I wonder how it can be that lightweight at that size while not even using a flexible screen. Maybe some progress in more lightweight glass production? Or an erring representative? That’s what they called it on notebook italia. dammit, I thought i had. It is really depressing to see “The new model will have a Carta E-ink screen” in 2017 when the Carta screen debuted in 2012. That is the problem with having a monopoly in a declining market, there is no pressure to innovate. I remember back then I hoped that in five years the eink screen would have native contrast orders of magnitude better (on par with print) and support color. I cynically thought it might be somewhat better. Even my cynical musings were too optimistic! We are still on the same tech after five years!!! All that has changed is resolution. I can’t believe it! It’s so so bad. For the active pen part, I would say they mean powered pen like those you find with Surface or something like that. Don’t know how can that improve customers’ experience, though: I thought low refreshing rate has been the obstacle. Active pen = powered pen = better/more “real” detection, no?